Can the Mountaineers Build off Their Success vs Oklahoma Tonight in Lubbock? To say Bob Huggins needed a win over Oklahoma is an understatement. We speculated that was one of their best chances to win for the remainder of the season. Fortunately the Mountaineers had some guy step up in a big way and help get the much-needed win. Let’s talk about what worked against the Sooners and also can the Mountaineers build off their success that they had in their last game? What differed from previous Mountaineer games? Well, Brandon Knapper had 25 points in 26 minutes off the bench. He went 4-of-6 from long range and also got to the line nine points by attacking the rim, hitting seven of his free throws. What Bob Huggins would probably point out about the redshirt freshman’s performance was that he only had one turnover. Knapper has been praised by Huggins in the past, but he has always been quick to point out his penchant for turning the ball over. Speaking of turnovers, West Virginia won the turnover battle. This was a staple of Press Virginia and not something the current edition of WVU basketball has been able to do. West Virginia commits 15.6 turnovers per game and forces only 13.2 turnovers this season. This team had a different look coming down the stretch against Oklahoma. Wesley Harris got 30 minutes which is a high number for him. Lamont West only had 16 minutes. Derek Culver battled foul trouble throughout the game, but he had six points in the last 3 1/2 minutes and Knapper had 10. The freshman duo did a great job of teaming up to close the show. When the Sooners closed the gap to two points at 65-63 with 2:11 to go, Knapper responded with a big-time three to push it to 68-63 with 1:50 to go. It was a great game for Esa Ahmad. The senior had 12 points, 13 boards and four assists. He only committed two turnovers in 37 minutes. Up next the Mountaineers are off to Lubbock for a quick turnaround and an appearance on Big Monday against the Texas Tech Red Raiders. Bob Huggins has mentioned several times how difficult it is to travel across the country with just one rest day between the games. The game is set to tip off at 9 p.m.
What can the Mountaineers build off from the win and take into this game? Obviously, not turning the ball over. Will Brandon Knapper be able to establish himself as the go-to guy for this team down the stretch? Will him and Derek Culver form an outstanding freshman duo that give Mountaineer fans hope moving forward? We’ll see tonight on Big Monday. 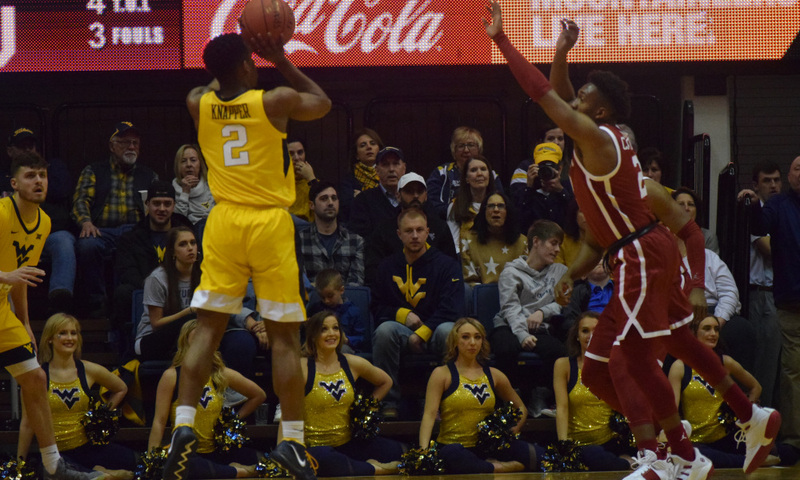 WVU opened their conference slate against Texas Tech back on January 2. This was a game the Mountaineers led most of the way, but were unable to finish, losing by a final score of 62 to 59. Getting to the line 32 times but only making 18 of them along with committing 22 turnovers was their undoing that night. Lamont West led the charge with 22 points, going 4-of-7 from three-point range. West Virginia will likely be without James Bolden and Sagaba Konate tonight. These two were expected to be the linchpins of the 2018-2019 season. Konate has been a no-show for most of the season due to injuries and Bolden has missed time due to injuries and foul troubles, but Bolden did step up big in a few games, including going for 31 against Oklahoma and 22 against Baylor in losing efforts.